For editorial services and consultancy related to veterinary medicine, please refer to our partner vetproduction. 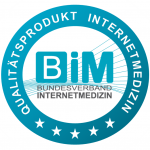 We are member of the Bundesverband Internetmedizin. Read more.